The programming completed in this Performance Training is built entirely on the principles of absorbing and re-apply high levels of force. While many traditional training methods teach athletes how to expel energy; little time is spent teaching them to absorb it. That is the entire point of this Performance Training, to teach an athlete how to appropriately absorb energy before applying it in explosive dynamic movements. By improving these qualities, every athlete will produce higher levels of power while also improving movement efficiency. This leads to higher maximal speed running, improved abilities to cut and change direction, all while using less energy than before. The ability to absorb and re-direct force or “load and explode” is improved individually through eccentric, isometric, and reactive training methods, as these three phases of muscle contraction occur in every dynamic movement completed. The importance of each of these three phases are explained in the paragraph below. The eccentric phase of movement is vital for deceleration of the body. It is necessary to train the eccentric movements as the body cannot produce what it cannot absorb. In Figure 1, the left line is eccentric, or absorbing force, and the right line is the concentric, or force producing capabilities of an athlete. The isometric phase occurs briefly between the eccentric and concentric phases. This concentric action commonly gets all the glory in athletics, but when we look more closely, the importance of the eccentric and isometric phases becomes more apparent. When these three phases of dynamic contraction are combined, the “V” shape is formed. By improving an athlete’s ability to absorb force eccentrically, the concentric, power production aspect is maximized, leading to improved sports performance. 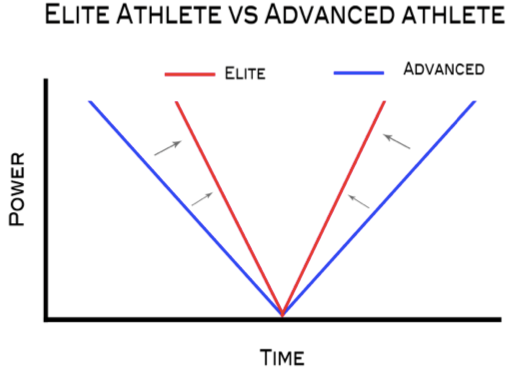 It becomes clear the elite athlete has an advantage based on their ability to absorb and produce force in a much more rapid fashion, while also working more efficiently with higher power outputs. Imagine an attackman attempting to dodge a defender. The athlete with superior triphasic muscle action (the combination of the eccentric, isometric, and concentric muscle phases) will have an advantage as both players encounter the change of direction that occurs with an attempted dodge. Basically, the athlete that can decelerate their body by absorbing kinetic energy eccentrically, come to an isometric stop, and then explode concentrically in a new direction in the shortest amount of time is much more likely to be successful. If the attackman has a superior ability in all three muscle action phases over the defender, the attackman is able to absorb and re-apply force more quickly during the dodge. The defender, lacking the skill to absorb forces at high rates, will take a few hundredths of a second longer to decelerate his body. This leads to extra time being required in the deceleration phase. When the defender is finally prepared to make his cut and match the attackman’s dodge it is already too late. The attackman has already completed his dodge and is headed toward the goal. The extra couple hundredths of a second it takes the defender to decelerate has cost him. The results displayed below represent the improvements in physical testing experienced by four individual athletes after a 6 week training program. Pre-Test, Post-Test, Change in result, and Percentage Change in result are all shown for four athletes who have completed this Performance Training Program. It should be stated once again that these results are after a twelve session (six week) program, which is a considerably short amount of time to experience the changes and percentage changes by these participating athletes. Each of the tests listed below have been specifically chosen based on their relationship to attributes required by elite performers in lacrosse. The parameter graph shown above allows each athlete to evaluate their own progress through this Performance Training Program, in this case Athlete 3. The results from Athlete 3’s pre-testing (red), post-testing (blue), and the group average of all athletes post-testing (green) are all demonstrated for all five tests completed. 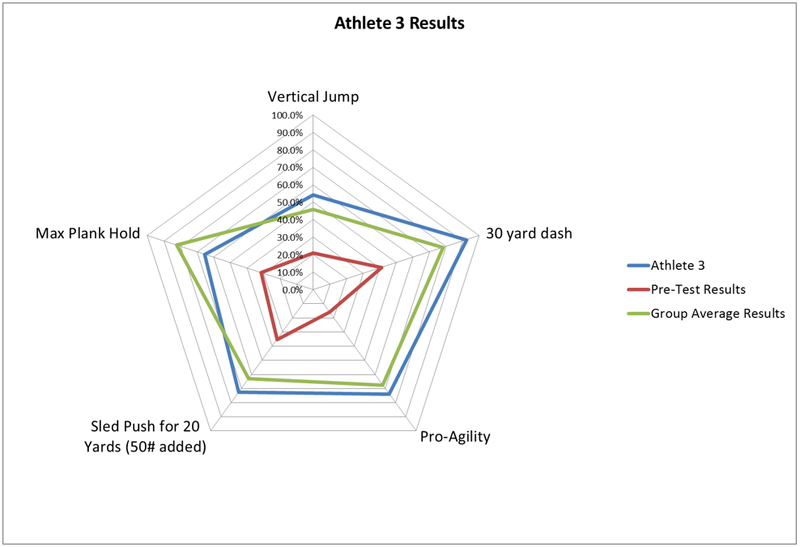 Through the use of this graph Athlete 3 is also able to visually see where the largest improvements were made during the training program, and how an athlete compares to the rest of the group’s results. In this scenario it is clear Athlete 3 made tremendous improvements in all five tests completed (based on the red and blue line comparisons). As all tests utilized directly correlate to improved performance in lacrosse, this graph can be used to determine specific physical areas of concern that may lead to reduced performance. Athlete 3 performs above the group average in nearly all tests, except for the max plank hold. This information could be used to place an increased emphasis on core strength/endurance as this may be the limiting factor for Athlete 3’s lacrosse performance. It is important to note that this graph represents physical parameters and in no way reflects technical/tactical abilities utilized in lacrosse. At $30/session this Performance Training Program is extremely cost effective, especially when considering the coaching as well as the results shown above are experienced. When compared to private sport training facilities, the affordability alone of this Training program becomes apparent, even without considering the exceptional results experienced by athletes. For example, an 8 week lacrosse training program is listed at the cost of $199. This is simply to be able to download the training program and includes absolutely zero personalized coaching (1). Other facilities cost $99 per month, which includes a written program and one coached training session within that month period (2). A third facility allows a 30 day trial for $99-$369 and includes one assessment, one private training session, and small group classes (3). Each of these private training centers not only cost more, but they also do not include the individualized coaching by a full-time collegiate lacrosse performance coach like this Performance Training Program does.